TrafMag Mobile, Banner, Teaser advertising network details. 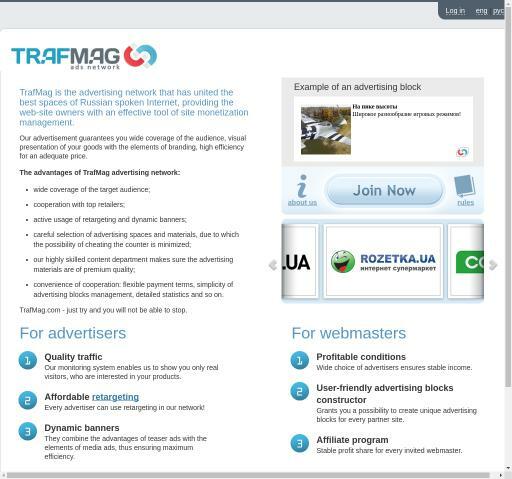 Trafmag is a monetization management website that provides its clients with innovative marketing tools in order to increase their profits and to make their brands popular. If you choose to become an Advertiser, Trafmag is providing you with a package of campaigns that is customized for your needs and for your target audience. If you choose to become a Webmaster, you will have a high income that is paid twice a month and you will work with innovative solutions that can increase your website’s monetization by 50%. Check the reviews on Affbank about Trafmag and for any details regarding their Target Audience, Pricing Models and Advertising Formats, reach the Information section.